Women's final. Tory is playing at a high tempo, volleying as much as possible and Gina is flustered making lots of errors. This continues for first 2 games and Tory leads 2-0. Tory leads 8-3 in 3rd and it looks all over but a couple of tough rallies and Tory looks tired. Gina takes it and the 4th to take us to a decider. It's close all the way but Tory closes out 11-9 for the title. Men's final. Piedro is hot favourite but josh has the home support. Game starts with both players just feeling their way in but from 7all josh finds his range with some trademark winners to take the game 11-7. 2nd is tight but Piedro looks uncomfortable and josh sneaks it 11-9. Josh is getting more confident and the winners are flowing. 11-5 to josh to beat the world no.68 and claim his first PSA title at the club where he has learned his trade over the last 7 years! In the second semi Josh Masters is out the blocks quickest , storming to an 11/4 first game with his usual array of hammered lengths and plenty of winners. In the second game a few mistakes from josh and some winners of his own from Tristan Eysele for 11/3 and one game all. Josh gets back to business in the third and fourth winning 11/3 11/6 to go through to his seconnd PSA final this year. Some tough match ups in Bexley, with some seeds taking an early exit! Schweertman, Fuller, Harris and Masters all came through fairly comfortably with wins over Broekman, Haley, Mulvey and Uherka respectively. Bexley member and former world no.53 Chris Tomlinson continued his fine form , beating Rauf from Pakistan 3-0. There was more good news for the home support with Brad Masters beating no.5 seed Jonas Dahler 3-1. Great performance, solid controlled squash and into 1/4 finals to play his brother! 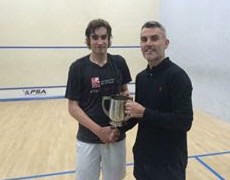 A perfect mornings squash for bexley was confirmed with head pro , Ben ford taking out England's no.1 junior Patrick Rooney 3-1. After winning the first two games fairly quickly , fatigue set in and Rooney capitilised to take the third , then the fourthth went to the wire with Ford winning the match 15-13. 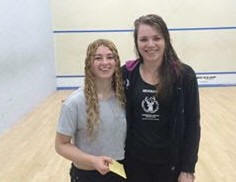 Last match of the session saw another shock with the no.2 seed Hopkin losing to an in form Tristan Eysele 3-1. In the quarter-finals Schweertman is looking comfortable as he sees off Harris 3-0. Next up Ford v Fuller. Brutal match with long rallies but fuller just had more in the tank to clinch a 3-1 win. Masters brothers was eagerly anticipated by the Bexley members. First game was tight , then Josh took control to close out a 3-0 win. Eysele took advantage of a tired Tomlinson to end his run with a straight forward 3-0 win. In the Women's English closed semis Gina Kennedy beat Alison Thomson 11/5, 11/6, 11/3 and Tory Temple Murray beat Kace Bartley 5/11, 9/11, 11/3, 11/9, 11/9.